Posted in: General Market Thoughts. Tagged: 90% Up Day, Daily $NYAD, NYUPV. $NYADV closed at 2699 when readings at or above 2500 indicate an extremely overbought market. $NYAD, the daily reading, closed at 2341 when 1800 indicates extreme overbought. $NYDNV closed at 46 when a reading around 150 would be considered very overbought situation. 93% of volume went into advancing issues giving us a 90% up day. Based on the above, the market is now short term extremely overbought and after a day like today one has to expect a pause in the action for tomorrow. Also, we got a 90% up day today, but the volume, 2.5billion shares, is on the light side. Still, price is the only thing that pays so for now let’s just put the light volume aside. What I don’t want to see this week on light volume is a follow-through type day. For such a day to be legitimate, it shouldn’t come until at least Wednesday or Thursday and Friday would be better but we’ve got the holiday so next week would be best of all. But it’s not a perfect world. While I believe the market has just put in a short term bottom, the possibility that the market has put in a major bottom can’t be ruled out. Every major bottom comes with all kinds of bad news and the bad news doesn’t just evaporate but lingers making it tough on Bulls & Bears alike. This capital gains tax increase could be trouble but for now the market seems to believe that Congress will come to the rescue of investors. While this is all getting sorted out, we have to see if the market can put in a series of higher lows and higher highs and establish a new uptrend. Shouldn’t take too long to figure out if today’s action has staying power or if it was just a mega short squeeze. Daily chart of $SPX showing two congestion zones. These are places where $SPX stalled, had a chance to go higher, but headed south instead. These are areas where buyers failed to show up before so they’ll need to show up now or what happened today will end before it really has a chance to get started. Also note on the chart the various ‘buy’ signals that were generated today. Still waiting for bullish crosses of MA’s but that will take several more days. Posted in: General Market Thoughts. Tagged: $SPX, 90% Up Day, AAPL, Stealth Distribution. 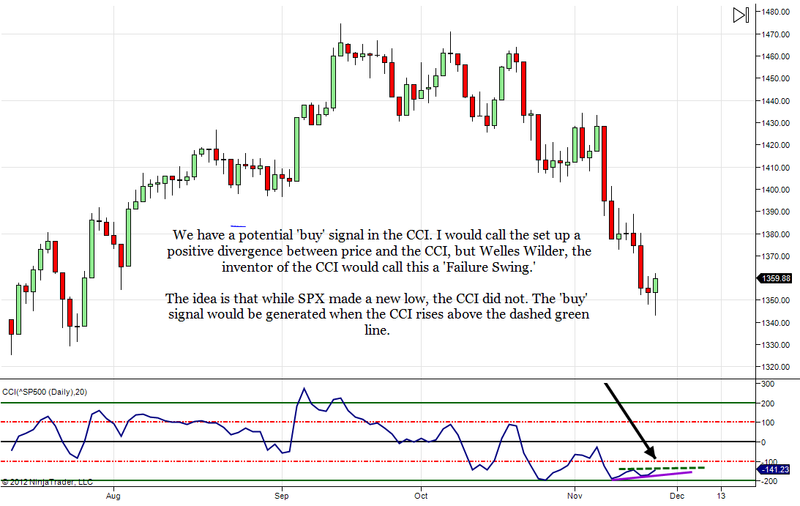 Edit Sunday, November 18th: I’ve added a chart at the bottom of the post showing a potential ‘buy’ signal for $SPX using CCI. Thursday’s spinning top indecision doji may have thrown the market into a consolidation phase, but one day of a rally is hardly enough evidence so what happens next Monday and Tuesday will be key. Consolidations in down trends will move sideways to up and can appear to be bottoms but we are several days away from getting fresh ‘buy’ signals so bottom fishers could regret jumping in here. By the way I measure the markets, Tuesday and Wednesday qualify as selling climax events. RSI on daily $SPX chart dropped to 27 on Tuesday and stayed there on Wednesday indicating an extremely oversold market. You will find readings in this area at every major bottom. Pre-holiday trading usually comes with light volume and generally favors the upside. Huge number of shorts at all levels above the market to squeeze. AAPL may finally get some buying interest as holiday sales will certainly help their bottom line. All rally attempts since the mid-September highs have failed. The last two consolidations produced Bear Flags and this consolidation is likely to do the same. 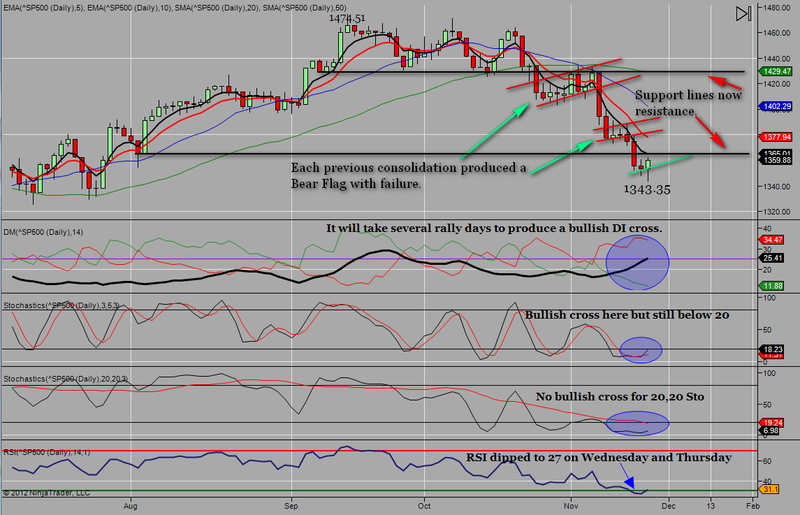 Daily charts won’t give legitimate ‘buy’ signals for several days and anything can happen before then. Friday’s little rally was probably just a head fake/dead cat bounce and while some may have been buying the pro’s were probably selling into the pump. $TRIN closed at 1.36 on Friday which is an incidence of Stealth Distribution and which means that all that glitters is not necessarily gold. The European Union and Japan have slipped back into recession. Uncertainty over capital gains increases will most likely lead to more selling and if not next week then the week after. A 90% up day with very good volume. We haven’t had a 90% up day since September 13th so if we get one next week it could mark a turning point in market sentiment. But it’s going to have to come on good volume to be credible and next week we will probably have light volume so such an event will have to be eyed with caution. IBD type rally with a follow-through rally coming within 3-10 sessions. If markets were to give us a 90% up day early next week, then longs would need to watch for another big rally day on good volume to prove that the market wants to go higher. Should we get a big rally day next week, then the follow-through day would need to come in the week of Novmeber 26th otherwise it will lack the necessary volume and thus credibility. AAPL. Has it bottomed for now? I have no idea why AAPL would bottom at any given price level but if buyers stream into this key stock, then the markets will go along for the ride. Bulls and Bears will need to be hypervigilant next week as there is the potential for the markets to transition from its current phase into a new bullish phase. But we are not there yet and we will need several days of market activity before any conclusions can be drawn. Daily chart of $SPX with all kinds of chicken scratchings highlighting the obvious. 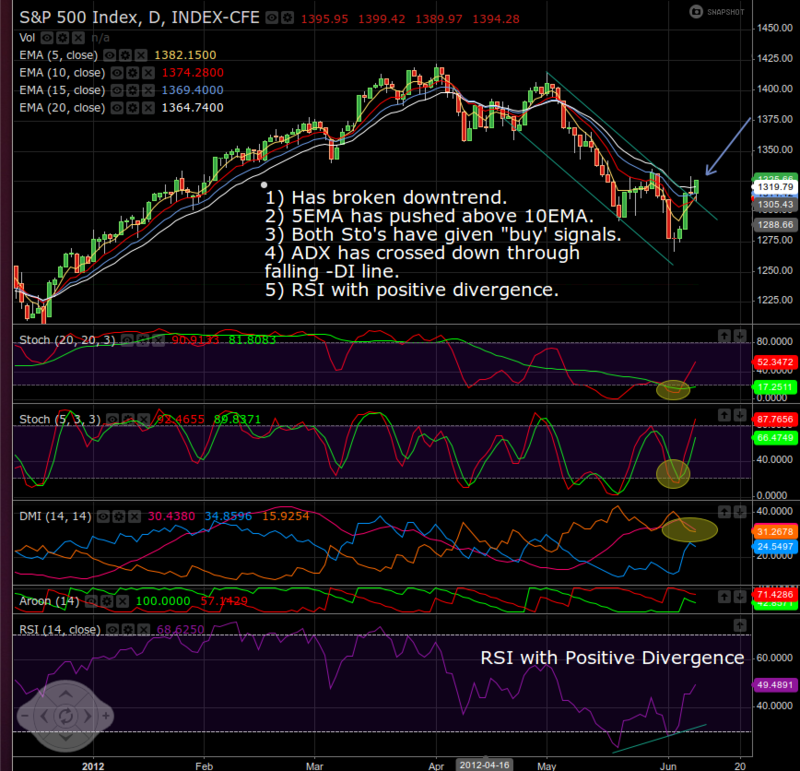 $SPX chart using CCI. Basically, once CCI rises above the dashed green line this method would generate a fresh ‘buy’ signal. From the mid-May low to the June low there was another such set up as there was a failure swing, aka positive divergence, between CCI and $SPX. In September there was another failure swing, aka negative divergence, between price action and $SPX indicating a potential top. We are now looking at a potential new ‘buy’ signal but it could easily be invalidated so even if CCI does give us a ‘buy’ signal early next week I think one needs to be cautious here as there are plenty of headwinds the markets will have to navigate before there is any real clarity in market direction. Just something else to keep an eye on in the early days of the week ahead. Posted in: General Market Thoughts. Tagged: $TRIN, 90% Up Day. Nope. Missed the move completely. Hope you made a ton of $$ and that you took some off the table, just to be safe. Have to come up with a new indicator that lets me know when a news story is about to break and send the markets to the moon. Now that would be worth some money. Meanwhile, in another part of town, many breadth indicators pushed deep into extreme overbought territory so don’t expect much for Monday. For example, $TRIN closed at .30 and about 95% of volume went into advancing issues. But we’ll see. Maybe another bit of news will come out of Europe and markets just lift off. My wife and I are leaving on a road trip to southern British Columbia on Thursday and we’ll be gone for up to a week so probably not going to be doing much, if anything, next week. Posted in: General Market Thoughts. Tagged: 90% Up Day, IWM, QQQ. Smart by half, as they say. Note on the chart that even though THEY pushed IWM, and others, pretty hard today, the RSI did not reach 70. This suggests more upside before any kind of give back. And with a higher close on $SPX at 1342.84 we now have both a higher low and a higher high. This is how rallies are built. We are also six days beyond the 90% up day from the 6th. If we’re going to get a legitimate IBD-type follow-through day then the markets should give confirmation of this by Wednesday or Thursday of next week. It will take a major rally of at least 2% to confirm per IBD’s criteria so watch for that next week. Interesting that Max Pain for the QQQ was 63 today. Took them all day to get there, but they got there just the same. Still watching from the cheap seats with no plans to chase the market and get back in so in the near future this site is probably going to get pretty quite. Posted in: General Market Thoughts. Tagged: $NYSI, $SPX, $VIX, 4 Week New Highs/Lows, 90% Down Day, 90% Up Day, SSO. I’m treating market events that have taken place over the past three weeks as a bottoming process. I have plenty of misgivings about treating these events as a bottom, but then I always have misgivings. Primarily I’m concerned that the timing is way off and that the market shouldn’t be bottoming until August/September or maybe October. So while I’m looking for the market to rise off this so-called bottom, I will be keeping a weary eye on future events with the full expectation that any ensuing rally is destined to fail sooner rather than later. It is my humble opinion that market dynamics have flipped from bearish to bullish and Friday’s rally appears to be confirmation. Until recently, the strategy of buying dips anytime and anyplace has led to pain for those employing this mindless strategy. However, just about everyone who bought dips going back to May 18th is now in a positive position, as are those who bought at just about anytime this past week. This kind of positive feedback and instant gratification will embolden others and the market should rise as a self fulfilling prophecy, or famous last words. First and, at least to me, most importantly we had a 90% up day on Wednesday, June 6th. This 90% up day followed a 90% down day on Wednesday, May 30th and another 90% down day on Friday, June 1st. These two 90% down days can be seen as capitulation events, though there were a couple of indicators that I follow that didn’t quite get into extreme oversold territory. Still, a 90% up day in a downtrend often signals a change in market dynamics and I am taking this event as such until proven otherwise. Secondly, $VIX has given a ‘sell’ signal per the 5/10 method. It’s going to be important to the expected rally leg for $VIX to remain in sell mode through the close of next Tuesday’s trading. Should it do that, then it will probably drop down close to the mid-teens by week’s end which will mean less volatility going forward and less volatility is always bullish. Third, we have positive divergence in $USHL5. Note on the chart that while $SPX has not pushed above the 1334 area from late May $USHL5 has put in a new high as well as putting in higher lows since it bottomed on May 18th. Fourth, $NYSI is trying to give a ‘buy’ signal in the daily chart. Now, in late April $NYSI gave a false ‘buy’ signal so it’s going to be very important for $NYSI to climb above the 20EMA which is now sitting at -344. You can also watch the ADX on the linked chart as well as the Stochastic for further confirmation of an expected confirmed ‘buy’ signal late next week. When the worm turns, you have to go with the worm. Fifth, both $NYA50 & NAA50 are now higher than they were on May 29th, in more signs of positive divergence. Lastly, and, perhaps most importantly, as you can see on the chart below, we have positive divergence in the RSI 14 on the daily $SPX chart. The fact that the RSI 14 dropped to about 23 would be signal enough that some kind of bottom was at hand, but that the RSI 14 failed to put in a lower low even as the market did just has to be seen as a positive going forward. Take a look for yourself. Go back as many years as you like and look for times when the RSI 14 has dropped below 30 and the market reaction that takes place afterward. But it’s not all cookies and milk. We have signs of negative divergence in $NYHGH & 4wk New High/Low Ratio. When it comes to putting $$ at risk, I like to have all breadth indicators in sync, which is not the case at the moment. The fact that these two indicators went backwards on Friday is a concern so these two will need to get back instep with the markets on Monday/Tuesday. As long as they do, then we should be good to go. I did buy some TQQQ & TNA on Friday. I consider these to be high risk trades, though not as high risk as my previous SSO trade. My positions in these two 3x’ers are small for now. I will be watching next week for the 9EMA to cross up through the 20MA on the daily $SPX chart before I consider adding to these positions. IMHO, for now the least risky trade will be on the long side. I don’t know how long this will last. The wheels could come off Monday based on news over the weekend out of Europe. Be careful. This is not your father’s market. We are held hostage by news events and HFT traders. While volatility may lessen in the short term, it is not going away. The strategy of buy-n-hold is an anachronism. Switching from bullish to bearish as the environment changes and taking profits when you can is the only way to survive. Oh, yeah, so the bastages closed SSO at what price on Friday? Posted in: General Market Thoughts. Tagged: $SPX, 90% Up Day, SPY. It did turn out to be a 90% up day and as a result the markets did get into overbought territory so this would normally bring about a pause day for the following session. But then Bernanke is supposed to double-speak something tomorrow so who knows just what might happen. This trade, which I was certain was about to backfire on Monday, is now up 5.8%, less commissions. In the process the RSI on the 60min chart has pushed just above 70 and this means that $SPX/SPY/SSO aren’t about to go much higher before there is some give back. It might be little more than a sideways move for a day or two, but it could also completely reverse. Since I believe this current bounce to be counter trend, I am getting ready to take profits sometime tomorrow, maybe at the open. The idea behind this trade was to illustrate the 60 Minute Trading Strategy in real time with real $. I follow and employ this strategy many times throughout the year but and I just wanted to show how it works. 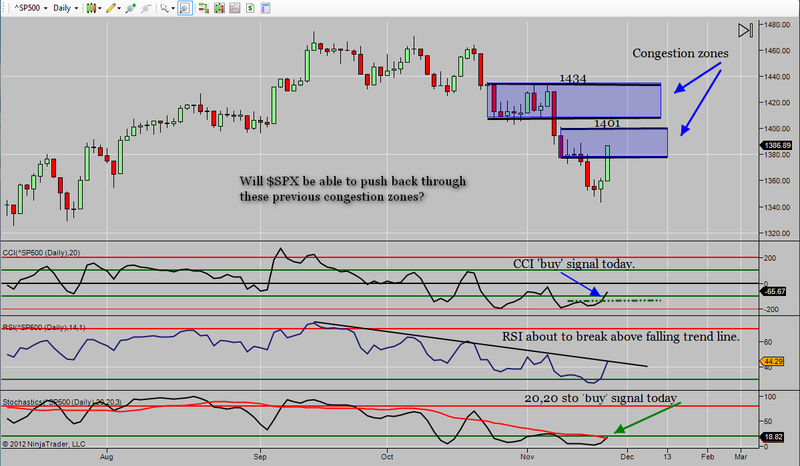 This pattern of oversold and overbought RSI’s in the 60min time frame repeats over and over again. Not every trade that employs the 60min strategy will be successful, but many are. However, if you should ever decide to give this strategy a shot, you do so at your own risk.